I made some pizza dough the other day and it just didn’t rise. That got me wondering if my yeast was still active as the dough just didn’t rise at all. 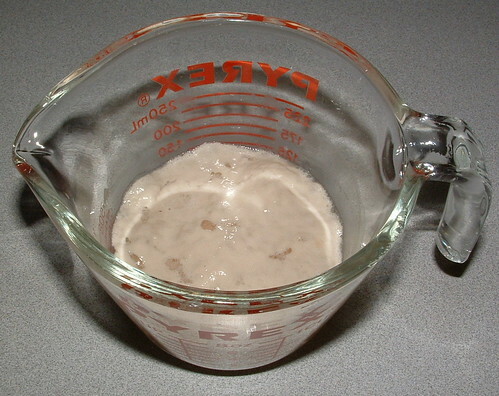 There are several methods for testing or proofing yeast to see if it’s still active. I used the process that eHow outlined to test my yeast. 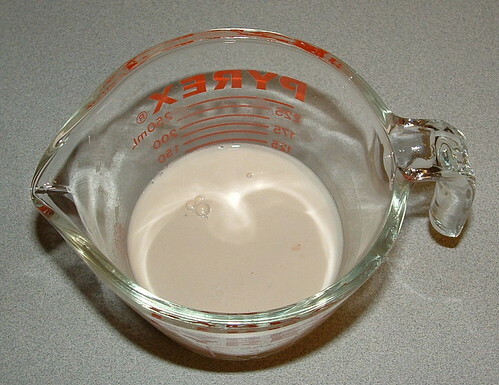 1/2 cup of warm water in a measuring cup. Check the temperature to make sure it’s about 110-115F. Stir in 1 teaspoon of sugar and add 2 teaspoons of yeast or packet. Let it sit for 10 minutes. If foam and bubbles form, your yeast is still active. As you can see my yeast didn’t have much activity at 10 minutes but after 20 minutes this was my results. Bottom line — I think my yeast is just okay but will proof it again before using it in a recipe. I hope you find this tip useful and use it next time you want to proof your yeast. I have found that yeast activity may depend on the weather. When it is rainy, our bread won’t rise, no matter what I do. Diandra: Thanks for this response. This is good information to know. But I do think my yeast is on it’s way to being dead. I thought after the 10 minute period it was dead and took my photo. But later when I looked it had bubbled up and had foam. But I will proof it next time before using it just to make sure.